The term “Archeometre” originates from the Greek and means “the measure of the principle”. The system refers also to a series of symbols and meanings, which refer to the federal drawer. ‘Archeometre’ is it the measurement of the ‘Archee’ (Universal Cosmic Force) of which the Hermetists speaks. Is it a process, a ‘key’ which makes it possible to penetrate the Mysteries of the Word. It is a measuring instrument of the first (primary) principles of the manifested universe. 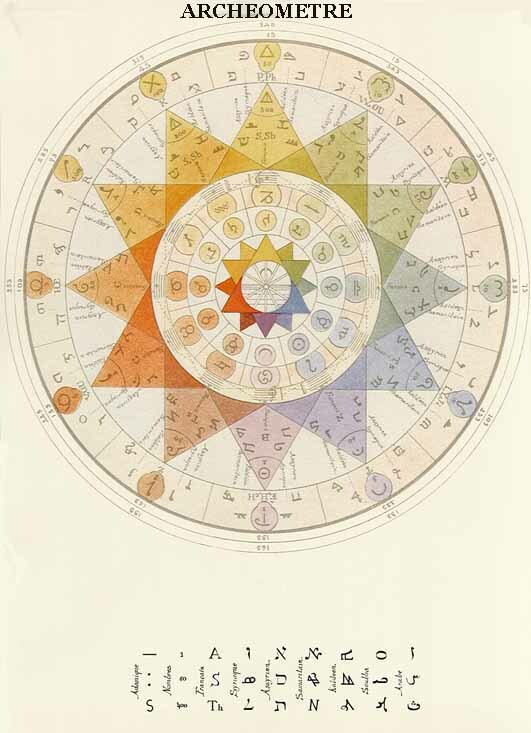 Alexandre Saint Yves d’Alveydre’s Archeometre shows the original Atlantean alphabet translates into the material the word, form, color, smell, sound and taste, the key to all religions and the sciences of antiquity.